September saw our volunteers working hard on the locomotive at the Sellindge site. 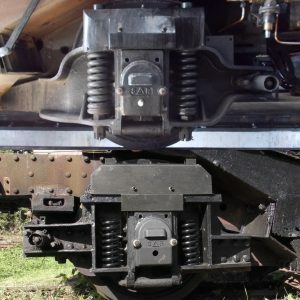 With the spring beams being completed by North Bay Railway Engineering Services the Society had hoped to be able to get the trailing truck axle sprung when test fitting all the new components. Unfortunately the hangers and various fittings weren’t completed by our machinist in time but we were still able to pose all the remaining components together to show the difference between the early cast style trailing truck and GSNs unique fabricated style design. The Society would like to thank all the volunteers who attended and the members who contributed towards the components. A full write up of the working weekend will appear in the next issue of the Packet due out late October. The Society will be hosting a sales stand at the upcoming Watercress Line Autumn Steam gala. The event has a Western region theme with guest locomotives Foxcote Manor, Large Prairie 5199 and BR Standard ‘4MT’ 2-6-4T No. 80078 all visiting the line. The Society would welcome any volunteers who’d like to help man the stand or people who like to find out more about the project to come along. Lots of exciting progress is being made with the project and today is the perfect time for people who are considering about signning up to do so. The General Steam Navigation Locomotive Restoration Society Membership costs £10 for the year with members being kept up to date with the latest goings on with the locomotive, receive our members magazine ‘The Packet’ 3 times a year with progress reports on GSN and articles about Merchant Navy’s and the light pacific’s, access to the locomotive when possible and the ability to get involved with the society. You can sign up by visiting our membership page here. As always thank you for your continued support.